The Source OC is an approximately600,000-square-foot shopping, dining, and entertainment retail destination which includes 58,000 square feet of premium office space on one end and a four-star, 178-room Hilton Hotel on the other. Located near Knott's Berry Farm, The Source is now nearing completion. To learn more about this new destination, LAOCDB was provided an opportunity to talk with M&D Properties Executive Vice President Luis C. Valenzuela.M&D is developer for The Source. The entrance is a multi-level parking structure on Beach Boulevard north of Orangethorpe Avenue. While walking to the seven-story office midrise located at The Source, you start to get a sense of the propertys size. On the far side of the development, construction is actively underway on the Hilton Hotel. The restaurant/retail area encompasses three-levels. The top level includes a food court and various upcoming eateries such as YG Republic, La Huasteca, which features authentic Mexican cuisine, and OOAK Kitchen, an organic vegetarian Chinese restaurant. The second level includes a specialty food hall. Also on the third floor is the flagship CGV Cinemas Cultureplex, a fully-immersive movie-going experience showcasing 4DX technology served up with luxury seating and a bar. More up-to-date information is available on The Source OCs webpage. La Huasteca Mexican Restaurant opening soon. This is their second location. Front entrance to the food court. Sign next to the door shows upcoming eateries at the food court. At its heart, The Source OC is designed to provide a destination where visitors can come enjoy various family-friendly events and experience the local community. Just off the main food court and in front of the theater is the main plaza, viewable from all three levels. The space has hosted such events as World of Dance exhibitions and a concert featuring local music. Behind the plaza there are two stories of stadium-style seating, a comfortable place to sit and mingle while enjoying the atmosphere of the retail center. Contestants and spectators watch the World of Dance competition at The Source OC. A:M&D Properties first development was more than 17 years ago. It was Plaza Mexicolocated in the City of Lynwood. This 425,000-square-foot retail lifestyle center sits on about 40 acres and is styled similar to a Mexican pueblo. 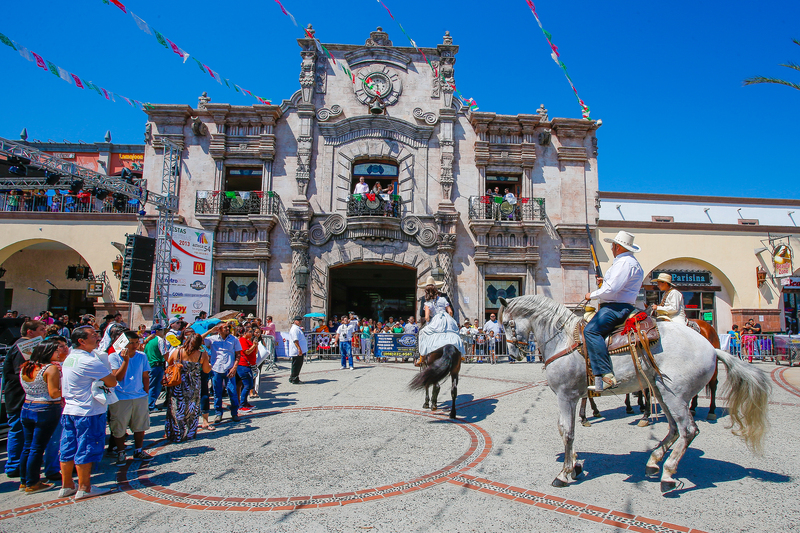 M&D incorporated authentic materials, landmark monuments and architecture from Mexico throughout the shopping center, and holds similar Mexican festivals there as well. Q: Please describe The Source? 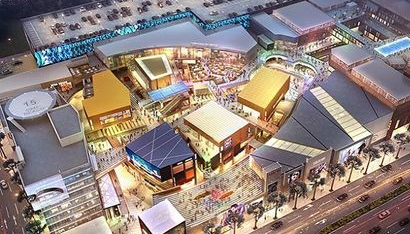 A: The Source is a premier entertainment complex in Orange County. It sits on approximately 12.5 acres with 400,000 square feet of retail on three levels. There is a 58,000-square-foot office tower and there is currently under construction a four-star, 178-room Hilton Hotel. The hotel is expected to be completed by the end of this year. 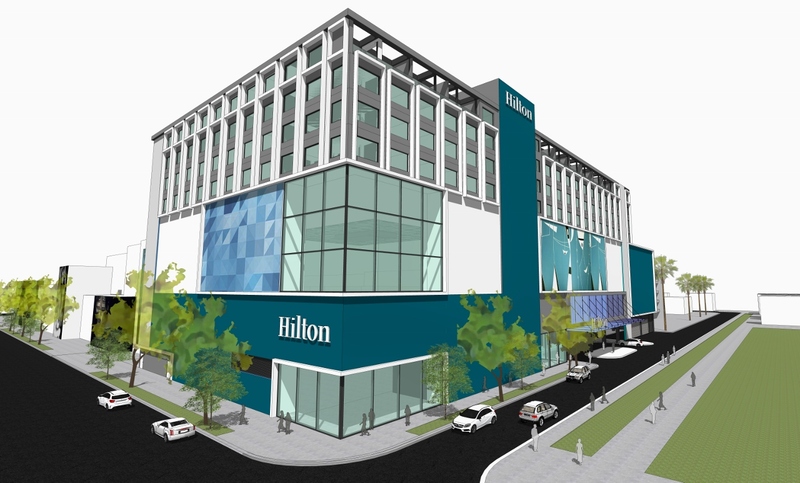 Rendering of the four-star Hilton Hotel. Credit: M&D Properties. Q: Who is the project architect? A: The architect is NBBJ who worked on notable projects such as the LA Live in Downtown Los Angeles. Q: How did M&D come upon a decision to build The Source at the corner of Beach Boulevard and Orangethorpe Avenue? A: The property had been sitting vacant for decades before M&D purchased it. M&D recognized the lack of retail and restaurants in Buena Park. With Knotts Berry Farm down the street, the site presented an opportunity to develop much-needed entertainment, retail, restaurants, and four-star hotel. Q: What type of exciting retail stores/restaurants can we look forward to? A: Most of the tenants here are first-to-market. Many of the food and beverage tenants come from Asia. We have new restaurant concepts from Japan, China, and Korea. These companies are already established in their market, in their home countries, and now they are launching their first operation in the US. In addition, we have a food court with 11 different concepts and a food hall that has about 13 different concepts. We have the second 4D theater in California and the fourth in the US. The tenant is CGV Cinemas. At 40,000 square feet, it features eight screens with a 4DX experience, Screen X experience which features a front screen and the two side panels with a 270-degree view of the movie, luxury seating, and a full bar. It is a world-class theater experience only at The Source. Front of CGV Cinemas at The Source OC. A full bar is available at the CGV Cinemas at The Source OC. Another entertainment tenant that is unique is Olympic Golf, a virtual reality golf experience. It is about 10,000 square feet in size with food and beverage service. The virtual reality experience lets you play any course in the US such as Augusta, Pebble Beach, and Torrey Pines. We are currently in lease negotiations with a major health club that we see as an anchor as well as a number of major restaurant concepts and a major retailer from Asia. Q: I understand the office building is considered the tallest building in Buena Park. Tell us more about this building. A: The building is seven stories and it is very modern in design. There are five stories of office space featuring floor plates of about 11,000 to 12,000 square feet. The Source will feature about 17 LED light panels that will be installed throughout the project. In addition there will be 17 static signs. This signage is for advertising and increasing brand awareness for our tenants. At night, The Source will light up similar to the Las Vegas Strip. This will be very exciting for Orange County and provide our customers a unique experience. View of the office tower which has a view of Knotts Berry Farm. Q: What type of office uses is M&D Properties looking for? A: We are targeting professional office uses. M&D Properties has taken one floor. The type of uses that are now considering space are mortgage companies, attorneys, insurance firms and a radio station. Q: There has been discussion about possibly building housing at the project site. Is this still a relevant component for The Source? A: We are entitled for about 1,000 residential units. I cant say whether they will be apartments or condominiums, but there will be a housing component to The Source within the next couple of years. Q: The City of Buena Park is undertaking a revitalization process on the Beach Boulevard corridor segment known as The Entertainment Zone, how does The Source connect with the Entertainment Zone? A: The key component was the four-star Hilton. It will be one of the finest hotels in Orange County and it will be one of the project anchors. The premier entertainment provided at The Source includes the 4DX cinema experience, international restaurant operators that will draw from both Orange and Los Angeles counties, and the virtual reality golf venue. We are also planning for a bowling facility, karaoke, and nightclub. In addition to all of this, we will have events on a regular basis. We have already hosted the World of Dance Competitions, Oktober Fest event, and the a Rooftop Cars & Sunset Car Show. Q: What are some trends you see with regard to development of retail centers? A: Retail has changed, considerably. It's not just about a transaction and going up to the cash register to pay for your item and leaving. Today retail is experiential and that is what we offer at The Source. There will be many different things to do. You're not here to simply shop. You will be doing something else because it will be innovative, fun, and exciting. Q: How can we keep updated regarding The Source? A: We have a website, where you can register for our mailing list [The Source Mailing List] to keep you apprised of everything that's goes on. Were also connected through social media channels including Facebook, Instagram, and Twitter.